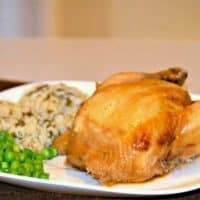 Crockpot Cornish Hens Recipe - Easy enough for weeknights! Crockpot Cornish Hens are a dinner obsession in my home. My teenage eating machine loves them because he gets a whole one for himself, and I love them because they’re so easy to make. You just need a handful of ingredients! Although they’re not called chickens, Cornish Hens are a specific breed of chicken. Traditional Cornish Hens originate in England where they were bred to thrive in that environment. They’re not egg layers, though, so they are specially bred for meat. 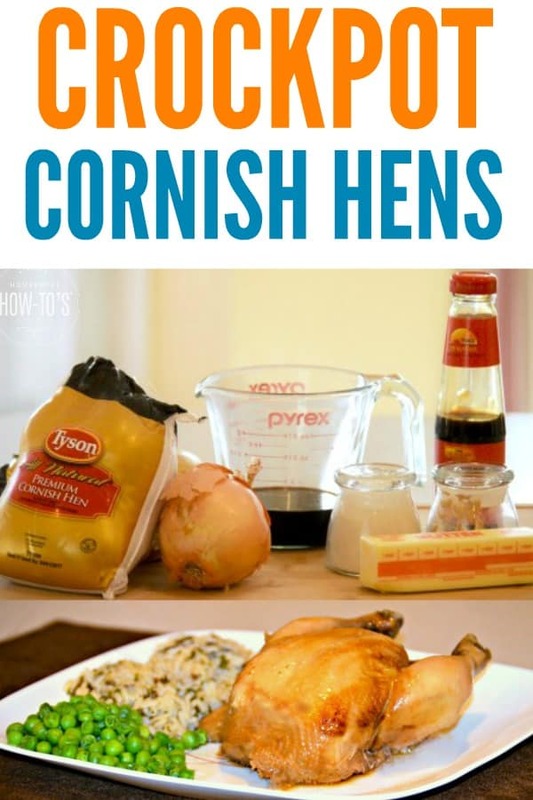 The Cornish Hens we buy in grocery stores are most often labeled as “Cornish Game Hens,” and are a cross between Cornish chickens and Plymouth Rock chickens. This cross-breeding produces birds that mature much faster than traditional Cornish Hens. Just as they’re labeled as “game hens” but aren’t actually game birds, they also aren’t necessarily hens. Cornish Game Hens are quite often male. Due to USDA guidelines, any chicken of any breed or gender can be sold as a “Cornish Game Hen” if it weighs between 1 and 2 pounds and is under five weeks old. Since Cornish Game Hens aren’t egg layers and so much effort is involved in getting them ready for market at a young age, they often cost twice as much per pound as a standard chicken. Fortunately, around this time of year, they’re very affordable. That’s because grocery stores stock up on them for the holidays when singletons and those with small appetites often prefer making Cornish hens rather than doing a full turkey. After New Year’s, their prices start falling and typically reach their annual low after Valentine’s Day, when many people serve Cornish hens as part of a romantic dinner at home. My store had them on sale at 2 for $5, so I bought enough to make the cashier ask the manager if there was a purchase limit. There wasn’t, but apparently buying 20 cornish hens raises some eyebrows. Whatevs. We love Crockpot Cornish Hens, is that a crime? The hardest part about making this Crockpot Cornish Hens recipe is remembering to move them from the freezer to the meat drawer in the refrigerator the night before. If you forget, as I have in the past, you can also defrost them in a cold water bath in the sink. As for the marinade, it doesn’t get easier: pour soy sauce, oyster sauce, ground ginger, garlic powder, and black pepper in a large resealable bag. Shake it up, add the birds, and squeeze out as much air as you can before sealing the bag. You can do this right after they come out of the freezer, and they’ll marinate while they defrost, or put the bag of defrosted birds in the fridge to sit for 20 to 30 minutes. After that, crumple four pieces of aluminum foil into balls and place them on the bottom of the crockpot. 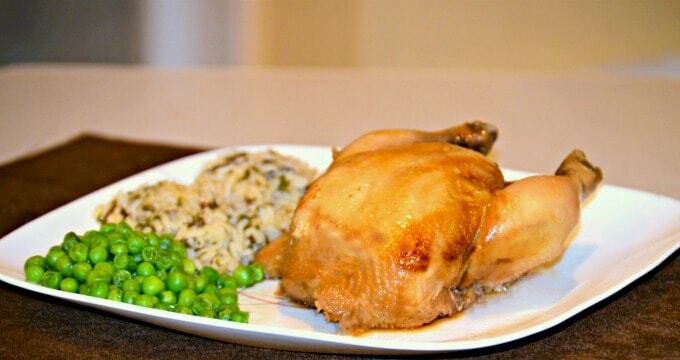 Put each Cornish hen on top of two aluminum foil balls to hold them out of the liquids as they cook. Or, if you’re an onion fan as I am, replace the foil with onions cut in half. They’ll stew in the meat’s juices and turn out delicious! Pour the rest of the marinade over the birds and cook them on LOW for 8 hours or HIGH for 4 hours. That’s all there is to it. You don’t even need to crisp the skin; the crockpot does it for you! It’d be hard to do that, anyway, since they’re so tender they practically fall off the bone. Thanks to the marinade they’re also perfectly seasoned, so I like to serve them with simple sides like long grain wild rice or mashed potatoes and peas. Talk about an easy yet elegant weeknight dinner! Shake a few ingredients together, pop them in the microwave, and enjoy tender, juicy Crockpot Cornish Hens even on busy weeknights. Cook on LOW for 8 hours or HIGH for 4 hours. Remove the crockpot lid and let the hens rest 5 minutes before transferring to serving plates. 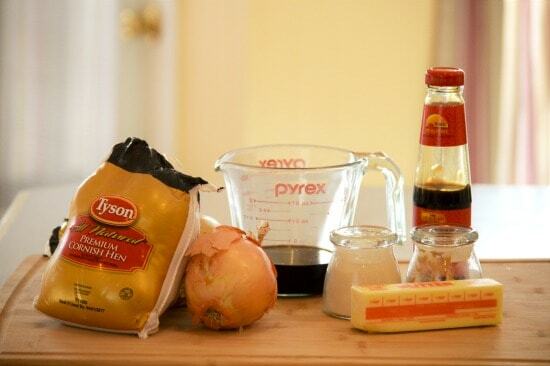 To crisp the skin, transfer the cooked Cornish Hens to a shallow oven-safe baking dish and broil for 2-3 minutes. Watch carefully to prevent over-browning. I’m making these babies today! I can’t wait!!! Crockpot recipes are always the best recipes in this house of 5!!! 5? FIVE??? Yep, I’d cherish my crockpot, too, if I had that big of a gang to feed. Have you tried the Instant Pot yet? It’s a slow cooker but SO MUCH MORE. I make flavored steel cut oats or hard “boiled” eggs (that the shells practically fall off from) for breakfast, then vegetable soup or steamed chicken (from frozen, in 20 minutes!) with broccoli for lunch, and anything from super tender spare ribs (45 minutes) to juicy pork chops (8 minutes) to whole “roasted” chicken (30 minutes) for dinner. I ❤️ my Instant Pot, and I’m just feeding two of us now. With a family your size, you’d love it! How long would you cook this recipe in the Instant Pot? 30 minutes as mentioned above? What if you cooked 2 or 3 Cornish hens? Thanks! Cornish hens used to be one of my mom’s favorites. Thanks for the yummy recipe! & Thanks for joining the Inspiration Spotlight party. Pinned & shared. Hope to see you again soon. Yep, busy men love crock pots, too! Sounds delicious. I love Cornish hens served with Brussels sprouts. Thanks for the recipe! You had me at Brussels sprouts. I love those! We just love Cornish Hens, these look so good! Thanks so much for sharing your post with Full Plate Thursday and have a great day! Growing up, we had Cornish hens all the time. As an adult, it hasn’t been something that I have made. This post made my mouth water. I know what I am making this weekend! Thank you so much. 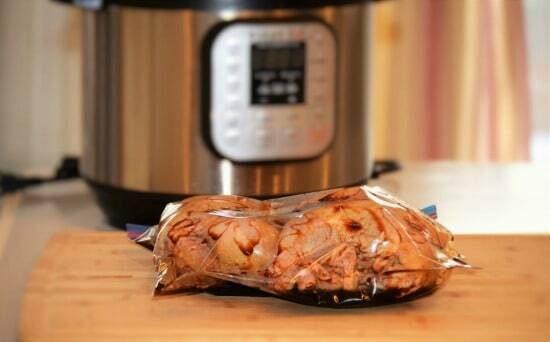 They’re so convenient in the crockpot, and they never come out dry! Your cornish hen looks beautiful! I have so thought about trying one or two in the crockpot and now I see it can be done! thanks for the recipe! WOW! Your cornish game hens are cooked so beautifully. Yes, but if your crockpot cooks fast you should check them after 6 hours.